The vast majority of people playing a big-deal MMO probably view it as an escape, something to do when not clocking in on the chores of daily life. Yeah, folks make friends and fall in love dressed in avatar skin but most players don't need it to survive. Some of them, however, do need to play a game to make rent or buy food. InRealLife shows what it's like on the other side. They're in World of Warcraft, MapleStory or any other popular online game with a huge playerbase. The people with belief-defying amounts of gear, loot, and HP. And the other ones, silently scurrying and bustling in the sidelines while you go off on another raid. How'd they get that stuff? How much does it cost, in terms of, y'know, dignity? What are they doing when you're offline? This new book—coming later this year from First Second—by activist/author Cory Doctorow (he also edits Boing Boing) and Jen Wang offers up a provocative look at where the juice in your average MMO comes from. IRL's main character is Anda, a high-schooler who gets pulled into fictional MMO Coarsegold, as part of a recruiting effort to get more girls playing the game. Once there, she teams up with a high-level player to learn the ropes and becomes part of an underground economy where in-game missions churn out real-world cash. Sounds like gold-farming, doesn't it? Is it okay if Anda does it? Doctorow's married to Alice Taylor—who played Quake competitively in the '90s and was the only woman on the first English national team—and drew on his wife's experience as raw material for creating Anda. But it's slippery slopes that come with being part of an online community that give IRL its tensions. The book touches on points that some people who play video games don't want to think about, like the social attitudes or economic politics surrounding the delivery and maintenance of these experiences. The reluctance happens because it's not easy to think about these things. "I am as guilty of this as anyone is. It doesn't feel good to think about it. I think that life in the modern world embodies all kinds of contradictions that are difficult to face," Doctorow said over e-mail. "We don't decide to abandon our principles in a rush—rather, they slide away in a series of incremental steps, each of which seems like a reasonable compromise based on the LAST compromise." "We are most capable of detecting relative differences. Once you've made a little compromise, another little compromise seems like not much, and another, and another. No one wants to admit that the fun bit of plastic he unboxed from Amazon this morning is awash in invisible blood, especially because, as an individual, there's nothing he can do about the blood, and not buying the thing doesn't make it any less bloody. So you draw the curtains." Gold farming is the kind of thing that captured the public imagination for a while and is now accepted as par for the course in massively online games. When asked why he'd want to re-visit the practice now, Doctorow said that "science fiction isn't about the future, it's always about the present." "When you contemplate the microscale phenomenon of a world-in-a-bottle like an MMO and the toy economy within it, it equips you with a graspable metaphor for understanding the macroscale world of monetary policy. In other words: thinking about gold farming is a gateway drug to thinking about money itself." The reasons you want money in a game are similar to why you want it in real life. Artist Jen Wang says that she's felt the pull, too. "For me just leveling up isn't as motivating as being able to micro-manage my fantasy life and acquire the perfect fruit trees for my fantasy house," she admitted. "I thought that would provide an even bigger contrast for Anda and the goldfarmers as well if one could purchase property and the other couldn't." IRL has a beautiful dream-like art style, one that eschews the hyper-realism fetish prevalent in so many games. "There's a lot of uncanny valley out there, at least in console games. It's so common we just kind of accept it!" said Wang. "What's exciting is the emergence of mobile games and how that's forcing designers to take a simpler, more graphical approach." "I'm seeing more games like Katamari Damacy and Journey that are completely unique. They're not trying to look like anything else. Just look at Superbrothers: Sword and Sworcery. Every background in that game blows me away! That's not to say that something hyper-realistic like Skyrim can't be beautiful, but overall I think we're better working with our limitations than against them." 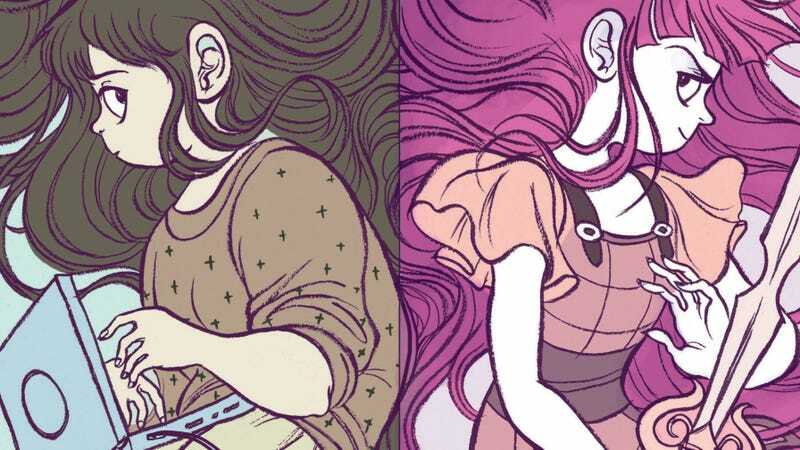 Though part of IRL's premise is that plugging into a game like Coarsegold can paint you into some morally uncomfortable corners, Doctorow also thinks that the connected nature of massive online games creates a powerful force for real-world change, too. "As I write this, it's almost the anniversary of SOPA, and that was astounding—eight million phone calls placed to Congress, [resulting in] a law that everyone agreed was inevitable nailed to the wall," he offered. "We have never before had the ability to find people who care about the same things as us, to weld our efforts together, and to move forward in unison than we do now."